Belle On Trend: Striped J. 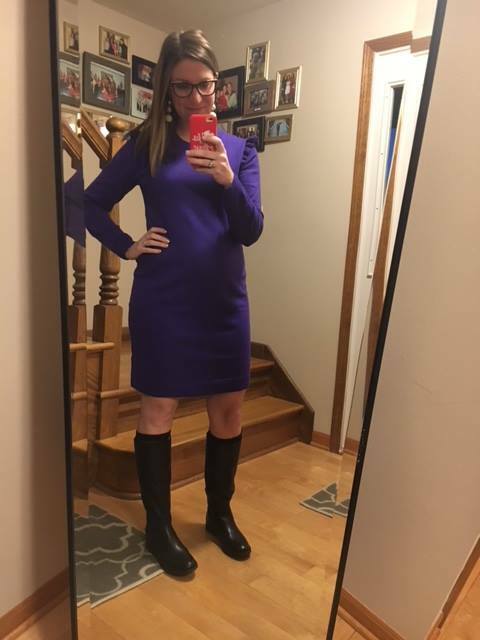 Crew Sweater Dress (non-maternity!) 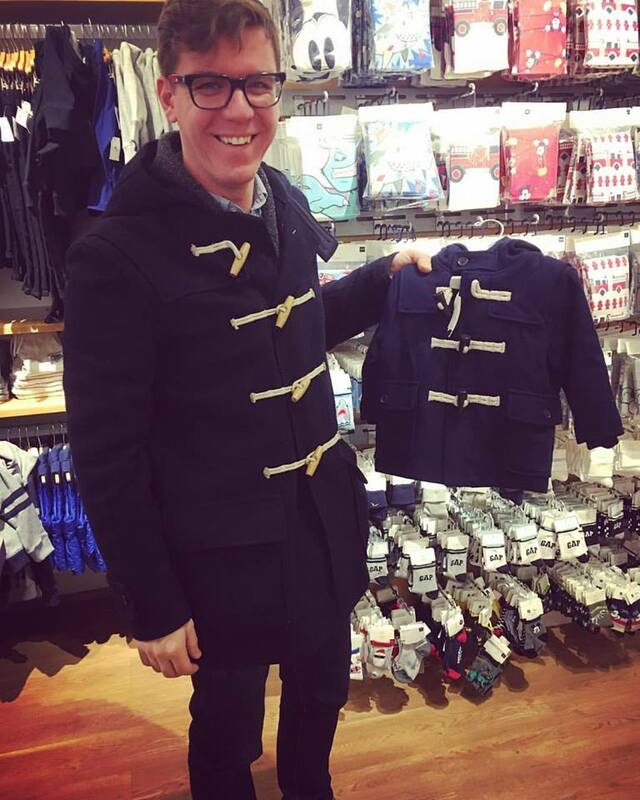 and Toggle-Button Coat! Striped J. Crew Sweater Dress (non-maternity!) and Toggle-Button Coat! I have definitely taken a liking to sweater dresses while I've been pregnant! 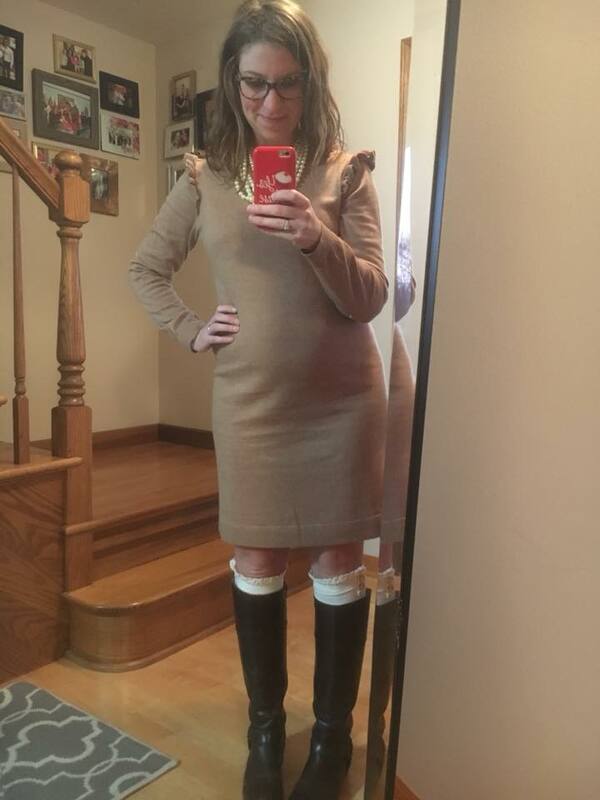 There's not an easier outfit for the winter than a sweater dress, tights and knee-high boots! This look is no exception-- I wore it to mass on Sunday, then to a family birthday party, and again today to work. The sweater dress is suuuuuuper stretchy and comfy, and it is on MAJOR sale. I got this one for $13 with a $25 gift card from my MIL! I'm wearing a large, but I actually am wishing I had gone for a medium. However, then I can wear this for the next 11 weeks (or as long as it's cold!). I just think it might be a little more flattering if I had sized down. This dress also comes in heather gray stripes! It's down to $31 with code: saletime! My new favorite Starbucks drink is the Blonde Latte!!! I get Starbucks 1-2x a week as a little treat-- just a tall-- but OMG. It is awesome!!! Obsessed with this ruffle shoulder sweater dress-- from J. Crew Factory. I have it in camel and purple! In a size medium for both. 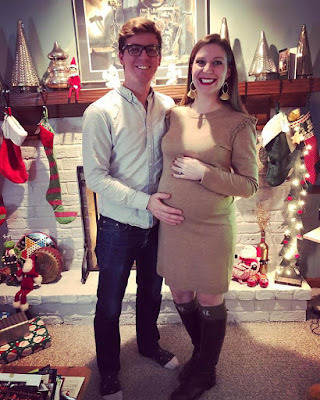 I bought these black riding boots at the beginning of my pregnancy-- I sized up because I knew my feet and ankles would be getting bigger. They have been sooooo comfortable for standing in all day while I teach. I highly recommend them! Arturo Chiang was a designer I hadn't heard of, but I tried on four other pairs of black boots at Von Maur, and these were by far the comfiest! The price point is also super reasonable! My Burberry scarf means so much to me. My aunt got it for me when I was in high school for Christmas. We are talkin' 2003 or thereabouts. I cherish it even more since she passed away; she meant so much to me and my family, and I think about her every day. I especially think about her when I wear items she bought me. I know she's reading Belle On Trend from Heaven and loving the blog :) but we just miss her so much. And, of course a Burberry scarf is an investment. However, I will say it is timeless, unisex and a real heirloom. My coworker, Dave, even has one he inherited from his grandfather that he wears! Burberry isn't going anywhere, so it is worth the investment. One day my kids will wear this scarf. It's a classic beauty, and it's even more special because it's from my Aunt Sue. Baby Boy's toggle button coat: here. This week FLEW BY because of no school on Monday!!! We seriously do not have any plans this weekend, and I cannot wait to just sit and sleep and not move too much ahhaha. Like Bella and Bentley LOLOL! But really, I am so beat! I am looking forward to relaxing big time this weekend and getting some more details of the nursery done. Oh! Would you guys be interested in a little nursery reveal/tour? I did a mini-one on my Instagram stories, but I would love to take pictures and have links to the adorable pieces we have. Let me know in the comments!